Well It’s a new week and a busy one at that. 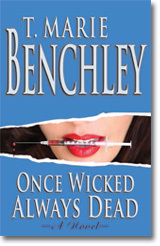 I would like to announce that my new book galley’s are flying out the door in response to those who are wishing to review my new novel “Once Wicked Always Dead.” I must say I am very happy and surprised by how many request that I am getting and hope that all of you will be pleased with the galley. I personally want to thank each of you for taking your time and showing such an intrest. Please keep in mind that these galleys are unedited and I am well aware of some of the mistakes that are scattered within the pages and I can assure you that all will be corrected before my actual release date. On another note, I would also like to thank David and Mary Trumbell for inviting me to attend The Robert Benchley Society Annual event in July. I am so looking foward to attending and I’m sure the day and night will be filled with much fun and laughter. Now that I have shown all of you a little of my serious side, I will resume next week in touching upon a more humorous nature but unfortunately you will have to wait until we meet again. This entry was posted on Tuesday, May 11th, 2010 at 7:49 pm	and is filed under Uncategorized. You can follow any responses to this entry through the RSS 2.0 feed. You can leave a response, or trackback from your own site. I really enjoyed the blog post. It is always nice when you can not only be informed, but also entertained! Thanks for making me smile at the end of long and stressful day. This maner of writing is perfect! Keep on! Will visit it again for shure! I Appreciate you for taking the time to discuss this affair. I like your perspective on this subject. Wow that is so awesome! Great post ! I wish I could do so good ! if have chance you can visit my site ,and give me some help, thanks! Thanks for this post! BTW – great blog! You are so inspirational and you talk sense. That’s important. You’re intelligent and you have a lot of heart. I love your posts! Thank you! I came throught your posts, i think your blog is awsome, keep us posting. Very absorbing post – Might be aged news, but it was news to me. This is my first time I have visited here. I found a lot of interesting stuff in your blog. From the volume of comments on your posts, I guess I am not the only one! keep up the great work. Hey, i¡¯m mostly an avid reader of magazines but every now and then I like to sit by my laptop and browse some quality blogs for interesting information. Thanks for making my sandwich and cup of coffee that more pleasant! I am really Glad i found this web site.Added tmariebenchley.com to my bookmark! As an amateur writer from Brisbane, Australia, I seldomly come across really well written publications like your blog which really helps me inspirationally. It shows me what superb postings are all about. There are lots of low quality writings on the web and it’s very sad. Thank you for your well written posts! I frequently read your blog and enjoy the content you share. I look forward to more of your work. well this blog is awesome i love reading your articles keep up the good work! Hi – really great web site you have established. I enjoyed reading this posting. I did want to write a remark to tell you that the design of this site is very aesthetically pleasing. I used to be a graphic designer, now I am a copy editor in chief for a firm. I have always enjoyed functioning with information processing systems and am attempting to learn code in my spare time (which there is never enough of lol). I was very pleased to find this web page.I wanted to thanks for this wonderful read!! I definitely enjoying every little bit of it and I have you bookmarked to check out new stuff you blog post. Yours trully, Keisha. That is nice to definitely discover a web page where the blogger knows what they are talking a propos. Your website has absolutely surpassed my expectations. From when I begun reading your blog site I have mastered fresh material and had previous information reinforced. Most definitely i’ll refer some persons that i know.